I came down with a Man Cold* and laryngitis** this week and it’s totally cramping my game, or it would be, if I had any. It’s pretty clear what the cold expects of me I’d like to it leave: loads of sleep, little activity and probably some bad reality television. But as I keep interpreting this as: go to a bookstore event, go to another great talk, take laptop to Genius Bar, watch my wind-up bug go… — essentially my rule for this week has been, if it’s a tightly-packed enclosed space a few degrees too warm with zero air circulation, I’ll be right over! — I shouldn’t be surprised that on Day 6 of this mess, I’m still a pill to be around. The only thing I like less is seeing this site go quiet while I wait for my appetite/creativity/enthusiasm to return, which gives me the perfect excuse to share some egg sandwiches I teased you with in December but have been hoarding since (seriously) 2012, when I created them for a magazine that never ended up running them. They’re short on process photos (though I’ve now experienced the vagaries of freelance life enough times to know: always take photos, lots of them) and lengthy details, but we enjoyed them all quite a bit at the time and will hopefully serve as a springboard for you for your own breakfast sandwich endeavors. Why egg sandwiches? I often feel on the weekends especially that I have to choose between going out and having a full day or having a really grand breakfast. And, while deli-style egg sandwiches to-go (here’s my riff on them) are everywhere in the city, they’re not exactly inspiring. Having a few packable ideas up our sleeves allowed us to be able to get our day started whenever we wanted (or were expected to by our in-house tyrant), skip both brunch lines and stale coffee shop scones, and still eat something grand when we got hungry for a real breakfast. * I’m sorry, I really have to link to this at least once a year, or until there’s a better exhibit of how terrible colds feel. ** Which I keep, adorably, insisting has nothing to do with the bachelorette party I attended last Saturday night, merely coincidentally the last time I spoke squawk-free. Shakshuka, a North African and Mediterranean dish of eggs cooked in a spicy tomato sauce, is my favorite way to intersect tomatoes and eggs. But it’s not portable. This, with added sweet peppers, a sprinkling of feta and za’atar, all loaded into a hand-held pita, is, and it’s wonderful, though keep some napkins nearby. If you can’t or don’t wish to purchase za’atar, there are many recipes to make your own on the web. My lazier approach is to use equal parts dried oregano, marjoram, ground sumac, ground cumin and toasted sesame seeds, along with sea salt (about half of one part). It’s delicious on everything from shakshuka to hummus to toasted pita wedges with a drizzle of olive oil. You can squeeze a single egg and bit of sauce in a small pita, but it’s tight. (Pictured.) A larger pita will hold one egg and a nice ladleful of sauce or 2 eggs and a lesser amount of sauce. Heat oil in a large skillet over medium-high heat. Once hot, add onion and cook until it softens a bit, about 4 to 5 minutes. Add garlic and cook for one minute more. 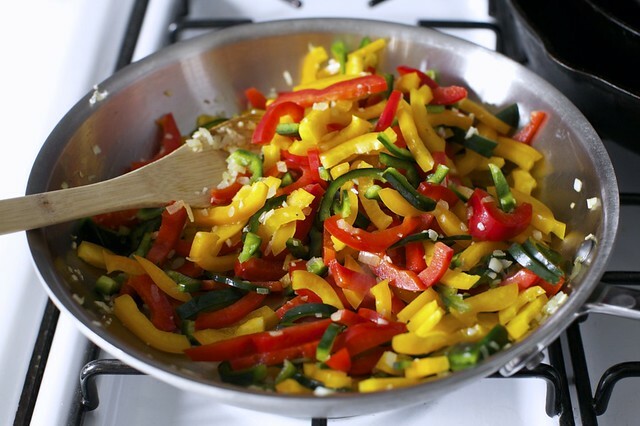 Add peppers (all varieties) and sauté them until they soften a bit, about 5 minutes. Add salt, paprika and cumin and cook for one minute more. Pour in tomatoes and then half a can (you can eyeball this) of water and bring mixture to a simmer. Reduce heat to medium-low and simmer sauce for 15 minutes, stirring occasionally. Adjust seasonings to taste. While sauce simmers, gently warm your pitas. Make 6 indentations in the sauce and crack an egg into each. Put a lid on the pot and cook the eggs until your desired firmness; after 3 to 4 minutes, they should have set whites and mostly loose yolks. After 5 to 6, they’ll be fully set in the middle. Sprinkle surface of dish with za’atar, feta and parsley (if using), holding a little feta and parsley back if you want additional garnish. 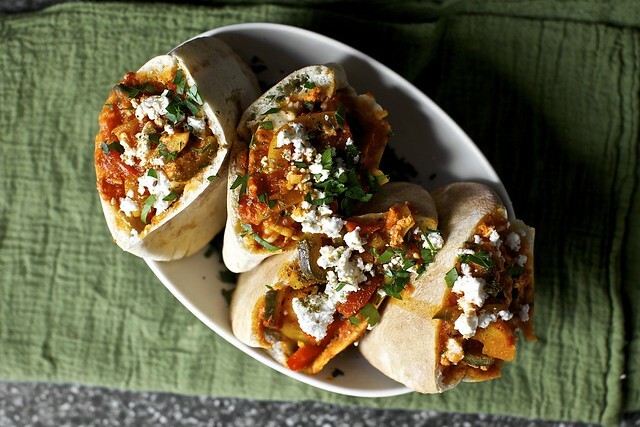 Cut open each pita and scoop one (or two, if using large enough to fit) egg and surrounding sauce into each pita. Garnish with reserved feta and parsley, if desired and eat immediately. 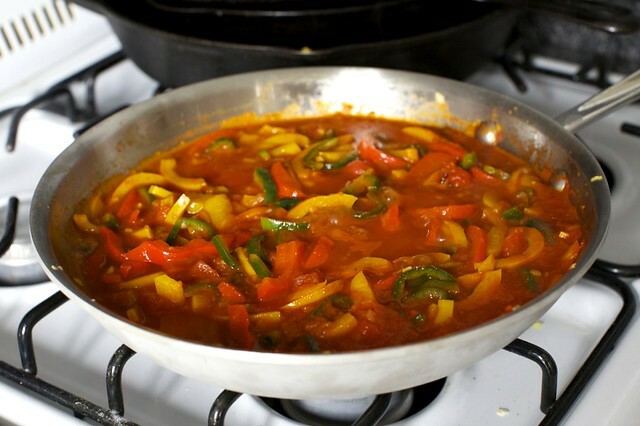 Do ahead: The sauce can be made in advance and stored in an airtight container until needed. Bring back to a low simmer before adding eggs. You’ll have extra of both shallots and, very likely, the pesto, but I don’t think you’ll mind. The former can be used for other sandwiches or salads (they also make excellent taco-toppers and slaw additions) and the latter can be spread on additional toasts. I’m tremendously fond of whole-grain Dijon mustard for this sandwich, because the whole seeds provide a spectacular taste and texture without being spicy. If using a smooth Dijon, which I find sharper, use a little less — I prefer the mustard here as an accent, a brightener, not a central flavor. Pickle shallots: Whisk vinegar, salt, and sugar together in a small, nonreactive (glass is my first choice) dish until they’re dissolved. Whisk in water then drop in shallots. Cover dish and chill in fridge for at minimum 30 minutes, preferably an hour, and even better if you can let them pickle for a day. Cook asparagus: Bring a wide pot of salted water to a boil then drop in asparagus spears. Cook for 3 to 4 minutes, until tender but firm. Plunge in ice water or rinse with very cold water to cool and stop the cooking. Pat dry on a towel. Make pesto: Transfer spears (breaking in half so they’ll fit) to a food processor, along with chopped garlic, Parmesan and 2 tablespoons of the pine nuts or almonds and pulse machine in short bursts until ingredients are finely chopped but not pureed. Drizzle in olive oil while continuing to pulse until just combined. You can run it until the mixture is fully smooth, but I prefer to leave it coarse. Assemble tartines: Spread each toast with a thin, thin layer of Dijon, about 1 teaspoon per slice. Spread asparagus pesto thickly over Dijon, about 2 tablespoons per slice (or more, to taste). 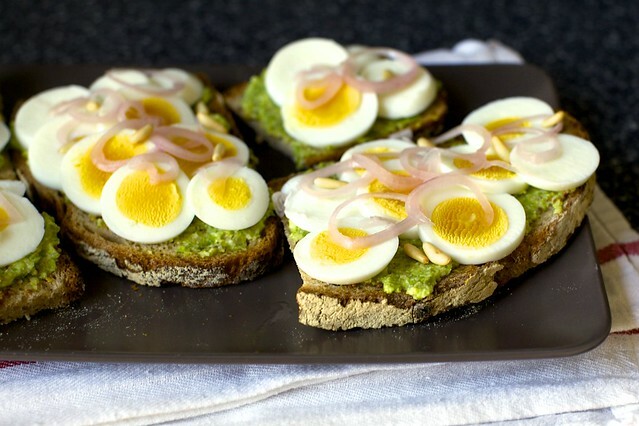 Slice hard boiled eggs thinly crosswise and arrange slices decoratively over pesto. Scatter pickled shallot rings over the eggs, and garnish with sea salt, freshly pepper and reserved tablespoon of pine nuts or almonds, if desired. Does a BLT leave anything to be desired? Wasn’t it perfect just the way it was invented? Isn’t a runny egg a total mess in the middle of a sandwich? Could anything be more outdated than white bread and iceberg lettuce? I suspect if you’re asking yourself these questions, this sandwich is not for you. But everyone else is probably halfway to the kitchen, about to make seconds. Cook your bacon in a frying pan or on a griddle until crisp. Drain on paper towels and set aside. Meanwhile, put your bread in to toast. Once toasted, spread each slice with mayonnaise, then stack one side with tomatoes, lettuce and bacon. Finally, cook your egg. Heat a small skillet (or, heck, your bacon skillet, in which case, skip the butter and use some of the bacon grease) to medium-high and melt butter. Once fully melted, swirl it around, crack the egg into the center and cover the pan with a small lid. Cook for one to two minutes, until the whites are solid (and hopefully, a little butter-fried and crunchy at the lacy edges). You can stop here, but I do find for sandwiches that it makes slightly less of a mess to then flip the egg and cook it for another 30 seconds, until it’s still runny but unlikely to run fully off your sandwich. Season egg with salt and pepper, transfer to bacon, tomato, and lettuce stack, then top with second slice of mayo-slathered toast. Cut in half and eat immediately. This is for people who feel that breakfast cannot be hearty enough. If a cup of yogurt or piece of wholegrain toast and jam could fall on a breakfast spectrum, this would be on the opposite end, a Tex-Mex riff on a roadside diner breakfast special off fried eggs, hash browns, breakfast links and pancakes. With that, you’ve been warned. Made ahead of time and frozen until needed, this is a fantastic weekend breakfast for when you’ve got better things to do than stand over a stove. In a large saucepan, cover the potatoes with an inch of cold water and bring it to a boil. Cook for 5 minutes, until somewhat tender, then drain the potatoes. Meanwhile, heat a 12-inch cast iron frying pan over medium heat, then heat the oil in it. Cook your onion until it is soft and translucent, about 3 to 4 minutes. Then, add the chorizo, breaking it up with your spoon as you brown it. Saute until cooked through and browned, about 5 minutes. Add drained potatoes and cook until they are fully tender and a bit browned at the edges. Season the mixture with salt and freshly ground black pepper. In a medium bowl, beat eggs and pour the mixture over the potato-chorizo in the pan. Cook until the egg mixture is scrambled and virtually cooked through (it will finish cooking in the residual heat), then divide mixture among tortillas. Scatter with queso fresco, cilantro and toppings of your choice. Eat immediately. Do ahead: Extra tacos can be wrapped in foil and frozen until needed. Warm in oven. Here, I tried to mash up some of my favorite breakfast things — cheddar cornbread, waffles, lightly creamed greens and poached eggs in a single, teetering sandwich. I realize that as far as sandwiches go, this one is a stretch. It’s precarious, at best. You’ll probably want a fork and knife around, just to be safe, or you could challenge the waffle’s indentations to catch all dribbles. Want to add yet another layer of delicious? Crisp up a slice of ham or Canadian bacon and add it to the stack, under the greens. Preheat your oven to warm and place a tray on a middle rack. Make waffles: Whisk flour, cornmeal, baking powder, sugar and salt in a medium bowl. In a smaller bowl, whisk together buttermilk, butter and egg. Stir wet ingredients and grated cheese into the dry mixture until combined. Make waffles according to your manufacturer’s directions. In the waffle iron I used – a thin one that made 6 rectangular waffles per batch – I cooked the waffles on the middle heat setting and needed 1 1/4 to 1 1/2 cups batter per batch. I made about 1 1/2 batches, yielding 9 small waffles. Transfer waffles to tray in warmed oven and leave them there while you cook your greens. Prepare creamed greens: Wash greens but no need to dry them. In a large skillet over medium-high heat, cook the greens until wilted. For baby spinach, we prefer it just barely wilted, which takes just a minute. For heartier greens, you’ll want to cook them a few minutes longer. Transfer greens to a colander and press out as much extra liquid as you can. If desired, coarsely chop greens. Wipe out pan and return it to medium heat. Melt butter and then cook onion until soft and tender, about 5 minutes. Return greens to pan and drizzle heavy cream over them. Cook, stirring, until cream simmers for a minute and mixture is evenly combined. Season with salt and freshly ground black pepper and set aside. Poach eggs: Poach eggs according to your favorite method. If you don’t have one, here’s mine: Heat a saucepan with a few couple inches of water to the point right before it simmers. Using a cooking spoon, create a whirlpool and crack your egg right into the center of it and stop swirling. The egg should mostly wrap around itself. Continue to let the egg cook, keeping the water from fully simmering, until the white is firmed up but it the egg still jiggles from the middle when nudged with a spoon, about 3 to 4 minutes. Scoop out with a slotted spoon and repeat with remaining eggs. 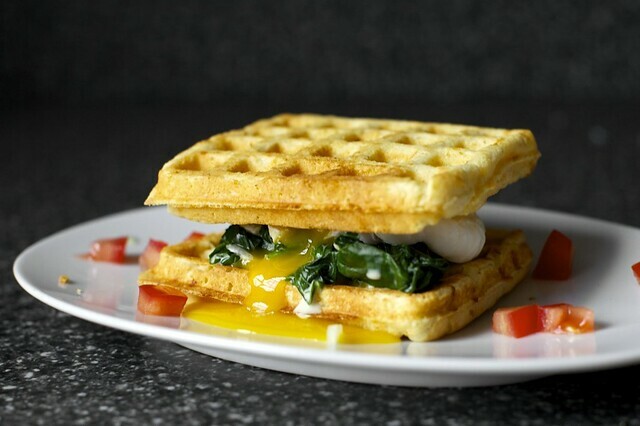 Assemble sandwiches: Place one square or wedge of waffle on a plate. Top with 1/4 of the creamed greens and a single poached egg. Dash with hot sauce, if desired, or a scattering of chopped tomatoes. Top with a second square or wedge of waffle and eat, precariously. These look great! As a recent shakshuka convert (we have it every other weekend for brunch lately) may I suggest using smoked paprika. It gives the dish an extra depth of flavor that makes my mouth water just thinking about it! So smart to turn Shakshouka into a sandwich, eggs and all! I love it. I’m sure a dollop of labne would be great on there in the absence of feta, too! These all look fantastic, and so colorful! The shakshuka pita will be first up on my egg sandwich to-do list – and what a coincidence that I saw this *just* as I was stepping out to go to the store. I hope you feel better soon! Yummy! All of those look so good- and I’m not even a big fan of eggs! These all look outstanding, the recipes as well as the photography. So colorful, especially the pita one! When I read the title, I thought this was one sandwich with 5 eggs! That’s a big sandwich. Hands down, my favorite post of 2014. I love egg sandwiches! I love your writing! And now for the specifics: I believe I first had za’atar only recently at a wonderful cheese shop/deli in Rosendale, NY (The Big Cheese is a must if you ever find yourself up in the mid Hudson Valley), on a sandwich that instantly overtook me with its flavor and out-of-this-world-ness. So you can bet I’ll be trying those Shakshuka pitas. The egg tartines call out to me as well- I love the addition of pickled (beautiful!) shallots and dijon mustard. I haven’t yet tried my hand at asparagus pesto, owing to my devotion to all things basil (though spinach typically serves as a sidekick), but I trust you and so asparagus pesto it is! Your whole paragraph about the runny egg BLT had me laughing! Oh Deb, thank you for this post right now and thank you for being such an inspiration to me in the kitchen all these years. Off to devour some eggs! I remember when I first saw the post where you showed the photo of the shakshuka pita, I knew I wanted to try it. These look fantastic. Also, I’m typically skeptical of avocado toast, but the pesto sounds really interesting. My husband calls egg sandwiches my default sandwich because if we have nothing else in the house to make sandwiches with, we usually have eggs…but these masterpieces are not default. Each one has a personality of its own and I would be happy to enjoy any of them. Thanks as always for the great ideas and hope you feel better soon! I now realize that is asparagus and not avocado. I could use more of both in my diet. Yum these all look great, but I’m drooling at the runny egg BLT sandwich! This looks amaaaazing! But I wanted to let you know about a little grammar edit in your third paragraph: “Have a few packable ideas up my sleeve allowed us to be able to get our day started whenever we wanted…” should be “Having” instead? You should feel no shame for this, giving such a bevy of sandwiches in the midst of illness is much more important than a little -ing! Katharine — Thanks, now fixed. The most portable sandwich — Probably the tacos, once wrapped in foil. We ate them on playground benches all weekend when I made them. I really wish you hadn’t done this! I want every one of these! So which of these is the most portable, or at least could stand up to a long bus ride and taste as good cold as they do warm? Thank you for this post! In my humble opinion, egg sandwiches are fantastic for brunch or dinner. As for the BLT: if a classic BLT plus an egg is wrong, I don’t want to be right. I am desperate for one or more of these sandwiches. Especially the shakshuka version. I love every single one of these sandwiches! Which to try first…that is the question! This is what I live on. 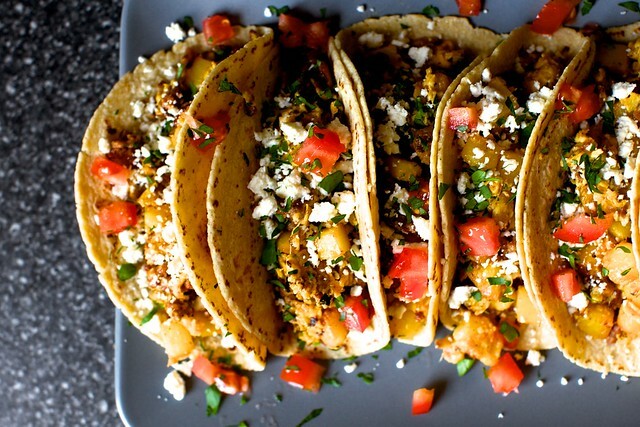 Every lazy weekend morning deserves breakfast tacos or something of the like. Thanks for the waffle sandwich inspiration!! Sorry but I had a few comments unrelated to this post. Really I just wanted to thank you! I have made your Kale and Quinoa Salad several times for friends and family-Those friends have since made the Kale and Quinoa Salad for their friends and family. We now affectionately refer to the Kale and Quinoa salad as “The Salad”. It is such a great thing when recipes become like a gift. It is what I always hope to happen when I take the time and effort to cook something new. When it happens it is wonderful! Thanks again! Love — love love love this whole post! Thought I’m pretty ‘meh’ on eggs ordinarily, drippy eggs have kind of become a go-to staple now that I’m pregnant. We’ve been living off your egg with creamed spinach sandwich — love these five options to add to the rotation!!! How can you say your riff on the street vender egg sandwich is uninspired? I love that sandwich and it inspired me plenty! As I melt the butter in the pan I throw in some chopped onion and a handful of spinach, give it a moment then pour over the egg and add the cheese. I have used any number of leftover veggies or condiments from previous night dinner, diced, to augment the simple egg sandwich to new heights…in mere minutes! I’ve never been overly enthused about egg-anything, but decked out with other flavors, they are transformed for me. So, thanks for some new ideas for a convert to the egg sandwich! Looking for creative ways to keep extra asparagus harvest that I don’t sell — can the asparagus pesto be frozen…. and for extended periods? Where are you that 5-6 minutes makes a fully set yolk? I’m about ten feet above sea level and eight minutes is still a wet dark yellow in the middle. Do you keep your eggs at room temperature instead of in the fridge? I think I was right to call in sick to work today (I’ve been trying to convince myself for over a week that I have hayfever and not a cold). The proof my head’s not working properly? I read all the way to the end of the pita recipe still wondering why anyone would need five eggs in one sandwich. So, not a five-egg sandwich then! 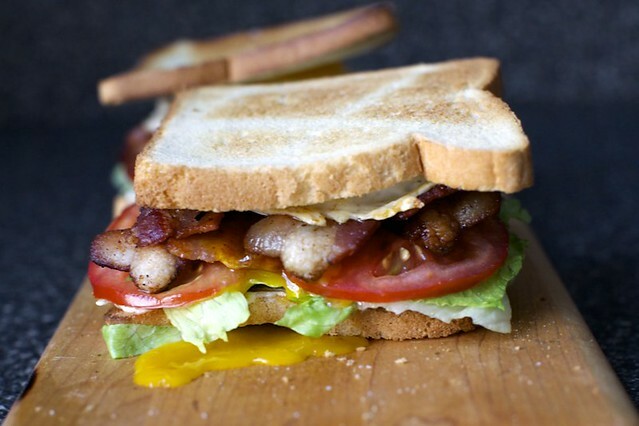 The BLT sandwich with a runny egg(s) is genius! Then I was like THERE ARE FIVE OF THEM. Good collection of sandwiches. Beyond the fact that they are easy to make, there is something about sandwiches that really makes me feel better when I’m sick. It just hits all the right notes! this makes me so happy – can’t wait to get cooking! you are so inspiring! Hi Deb, finally I may now be inspired might to add some savory breakfast mornings to my week instead of my tendency to go more sweet! Can you recommend a good corn tortilla store bought or good recipe. I’ve had no success. White or yellow? I’m curious to know the difference between a “male” cold and a female one. With all the “man” stuff lately, man caves, man cards, etc. it begins to feel subtly sexist. Shelley — I haven’t tried to, but that doesn’t mean it won’t work. Susan — Aw, thanks. Bad wording; I meant the deli versions I get aren’t inspired. Usually. Mariachi — Those were times I got. You’re dropping the eggs into simmering liquid — at least here (sea level) it doesn’t take long. This isn’t the same as a hard-boiled egg in the shell; those, for me, take 10 to 11 minutes if dropped into boiling liquid. WOW! The” Man Cold” clip is one of the funniest things I’ve ever seen. The swimming “bug” is one of the cutest, and these 5 “sangwiches” seem to be 5 of the tastiest and easiest! Even feeling under the weather you have managed to make my weekend! All of my senses taken care of in one felled swoop ( because I can practically smell the bacon). LOVE this blog for that ( and SOOOO many other reasons). i think i could live on egg sandwiches. yep. i especially love the look of the shakshuka version! I am so excited to see these recipes! I love breakfast sandwiches and have been waiting for this post since you mentioned the sandwiches back in December. Thank you, thank you. Our morning meals just got reinvigorated! These all look amazing! Now the only problem is to decide which one to cook first..
My brain has been on strike when it comes to cooking these last several weeks (cereal for dinner, boxed mac and cheese, etc.) but these look like just the ticket to help ease me back into eating proper grownup food. Bless you. This may just be the most epic egg post EVER!!! These sammiches look sooooo good. I think I’d go for the Shakshuka Pita first. Deb, those pitas are making my mouth water seriously!! It must be Friday cuz when I first read the headline, I thought you had made a single sandwich with five eggs in it and that’s why the poor man in the picture looked so miserable… Anyway, my bad. These all look delish. OH feel better!! I had that cold, it HURT at first & then it went to the nose for a week, & laryngitis the week after. At lest the low talking & the squeaking sounds fun. Luckily I had made the crock-pot chicken stock before The Cold hit, how wonderful & easy that one is! This time instead of wings, I saw chicken backs … ew, but the whole pack was $2. A whole onion & too much garlic. It was just right, even if I couldn’t taste with the cold. Good luck & feel better! One of your best posts. Eggs make everything better. My husband’s specialty is “Runny Bacons.” Toasted bread, fried eggs with runny yolks, extra crisp bacon, cheddar cheese, mayo, ketchup. The highlight of my weekend. This is why we love you Deb, because you know one egg sandwich recipe isn’t enough. Deb, zomyGod, this is great. Fancy timing too since I just made my own version of your spinach open faced soft boiled smashed egg sandwich the other day for dinner. However, I didn’t have feta cheese, so use a sprinkling of parm cheese instead and had bacon crumpled on top, it was all good. The spinach was sauteed and drizzled with lemon juice, salt/pepper before placing onto the herbed baguette slices I had in the freezer. I cannot wait to try these. All the gorgeous photos were pulling me into the kitchen.Thanks for being so creative, I love to read and try out many of your recipes. Sorry you are not feeling well. Feel better soon. Recipes look delicious. Man Cold and those other Man Stroke Woman clips are hysterical! I love breakfast sandwiches therefore I love everything about this post. Thanks for sharing! Hi- deliciousness with two typos- and that’s because you are under the weather! 1st: tacos- cook youR onions…2nd: BLT- cook youR bacon. Please feel better- and thanks for your clever inspirations! Happyfoodie — Thanks, now fixed. Shakshuka was the first thing I have cooked from your blog (I’m a newbie!) and it was awesome!! I live in the Middle East so I was happy to find another new way to use za’atar. Delicious, will definitely add to my easy-to-cook brunch arsenal. Thanks! I feel your pain! I had that cold too. Really nasty one! First week felt like an allergy, 2nd week I was home from work (I NEVER do that!). Third week coughing. Fourth week, still coughing and so tired! Fifth week more of the same. Sixth week – I’m feeling normal again! Sending wishes that your cold is much shorter than mine was! PS: Love your blog, and your cookbooks! I can’t believe these didn’t run – what an amazing array from such a simple idea. I will take one of each, please! Once again, just skimming the latest entry and you make me want to cook everything! Do hope you’re feeling better, soon. And congratulations on keeping up despite all. Yum! Definitely make that last one soon!!! Doesn’t that make it a BELT sandwich? These look amazing! I recently picked up a za’atar blend and really like it. These could also be good in the summer when you want the cooking done before the kitchen heats up. These all sound delicious! Our all time favorite is a fried egg with homemade maple peanut butter sandwiched between two waffles … yumtowm! I am very sorry to hear that you went out into crowded and confined places when you were obviously infectious. How many people are now suffering from whatever you had as a result? Did you think of that at all? The most considerate thing anyone can do if they have a bad cold is to stay away from other people as much as possible. get well soon.In the meantime -make the best of it, as I can read from your wonderful recepies. I hope you feel better. I am loving these egg recipes. I am dying over the Shakshuka sandwich. That is one of my favorite dishes and to have it in a sandwich sounds amazing. So glad you posted these. I remember the hint you dropped. I love eggs and am glad to have something new. It’s looks delicious. Perfect blog. Thanks! These has got cholesterol written all over it. But you got to love eggs. It’s also my comfort food when I have cold. I attended a talk about blogging yesterday at the Ballymaloe Literary and Food Festival and Smitten Kitchen was mentioned as a perfect example of a food blog – and I couldn’t agree more! Beautiful photographs and mouth-watering recipes in one place! Who could not love it? I love now u turn a simple egg sandwich into 5 gourmet fabulousness, we need this for the packed lunches this week! Thanks for the genius creations. Holy moly! I’ve died and gone to heaven! Well the bachelorette party must have been fun at least! lol Thanks for the recipes these look really great, now I just have to decide which one to make first. I also have a ton of ideas to use those cheddar waffles in other recipes. I’ve never tried a hearty waffle before so that should be interesting. For the runny egg BLT I might try using some Texas toast to maybe soak up some of the egg more easily. You had me at shakshuka. Homesick Texan did a great post on them a while back. The runny egg BLT looks exactly like this cheap, yet tasty sandwich I’d get in Capistrano, CA, at this super run-down looking donut shop, of all places, called Donut World. Yum. Will definitely be making this. Yes! Love it and thank you. I am a true fan of egg sandwiches – Long Island egg salad, New England BaconEgg&Cheese (yes, that is all one word), or the PacNorthwest Egg on Rye with Smoked Salmon. Thank you for this post! All of these egg sandwiches are amazing! I won’t run out of egg sandwiches for weeks to come. Where have you been all my life? Love these recipes and your writing. Can’t wait to try these! Hello! Long time reader, but I think this is my first comment. I just wanted to say, asparagus pesto is so smart! I made a modified version of that sandwich for dinner last night, without eggs, funny enough, and with pickled radish instead of shallot. But I hate boiling and shocking, so I actually just put the olive oil, asparagus, salt, pepper, & garlic in a roasting pan for 35ish minutes at 350 and then scraped it all into the food processor, added the nuts and cheese and whirred it up. It worked really well! This is so wonderful!! Thanks for all of the inspiration! Egg sandwiches are my BFF. Pretty much perfect for any meal, and these look AMAZING! Especially the shakshuka one—why did I think of that? Made the shakshuka tonight for a crowd of hungry college students and it was a big hit (and doubles very nicely)! We had trouble getting the pittas to slice properly so made them open-face. Still delicious, but definitely messy. I might omit the extra half-can of water next time, as the sauce was a bit on the runny side. I made the asparagus pesto with asparagus from my garden and served it with whole wheat rotini. It was fantastic! Everyone enjoyed it. Thanks for the inspiration! how is a man cold different from a cold? love the recipe. will try this tonight and feed the kids and family. I with the woman who went off into left field with the title. She thought it was 5 eggs in one sandwich and so did I at first. Then I reject that and thought it was five different kinds of eggs like chicken, duck, goose, quail—-got stuck after that. Ha. Instead what a much better surprise—–I love eggs. I could eat them everyday one way or another. This a quite a varied selection of recipes. I want all of them! But I’m heading to the kitchen and making the shakshuka one right now. These all look amazing. I especially love the asparagus pesto, YUM!! I’m not a fan of runny eggs, texture issues, but I’ll cook my eggs well done and enjoy these recipes just the same. Thank you for posting! Okay, I’ve made three of the 5 so far this week as we’re on a staycation and my husband loves eggs. The Shakshuka was awesome and by far our favorite… and we aren’t people who even have za’atar yet alone knew what it was. Also made the tacos and they were excellent as well but we added some salsa to make it a little less dry tasting. I made the waffle one tonight and there has to be an issue with the greens recipe.. I boiled my greens first then sauteed with the onion like I do normally for creamed spinach but just was a bit bland and dry. The asparagus one is hopefully tomorrow’s breakfast or dinner to cap off our run. Thanks for the recipes.. I’m sure we’ll be coming back for that Shakshuka. “I have to choose between going out and having a full day or having a really grand breakfast” Ain’t that the truth. (Much obscured by many rose-colored blog posts.) These all look delicious, as usual. We love to eat foods – that is a fact. Eating is always a pleasure for everyone; it suffices our hunger, nourishes our body and just simply makes us happy. What we don’t know is that all of these, or virtually any food that is manufactured and sold in the supermarket, are made of one of the healthiest foods from nature – nuts. There are different kinds of nuts, and they are actually beneficial to our health. Indeed, we are nuts for nuts. Let Detox Central introduce you to a wonderful world of these crunchy vitamin rich munchkins! Shakshouka = omg fantastic! Made it this evening as directed for my very happy family. Only quibble with recipe as written: it took more than 6 minutes for egg whites to set. Only quibble with the dish: the amount given in the recipe disappeared in one sitting! Wow, these photos are crazy delicious! I have never in my life seen an egg look so good! I love the pittas especially…aside from looking insanely voluminous…they are basically my favorite things ever rolled into a chunky pouch…Mediterranean veg – snappy red peppers, drizzles of olive oil and creamy feta. Food rarely gets better than that. Awesome photos. I’ve made the asparagus pesto and served it over whole wheat rotini twice so far and it’s the best! Thanks for the inspiration! i luv yur recipes so much smitt! u hav gud tastes in fud! OMG! I love your sandwiches so much. I always cook open face sandwiches in my toaster oven. But I never imagined that sandwiches can be that lovely and attractive. I made the Shakshuka and it was delicious. I had only one problem – by adding the water, it took at least 30 min longer to simmer off all of the liquid to make the sauce thick enough to be poured into a pita. Maybe don’t add the water initially, just add as needed? Or just expect to simmer for a lot longer. Thanks for your creations! 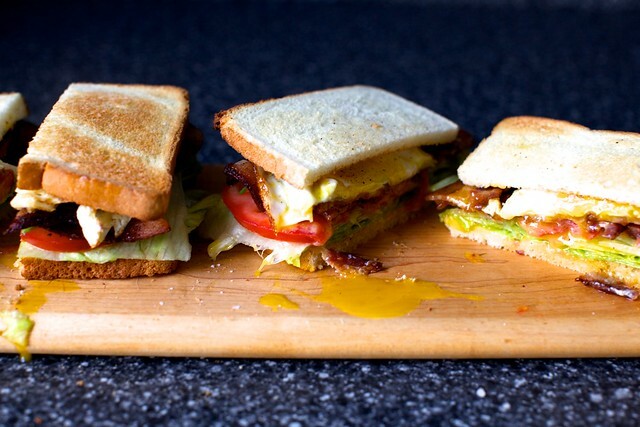 I love a good fried egg sandwich, BLT style just makes it grown up! falls under the bready category, no? Just popping in to say the shakshuka sandwich (fun to say!) is a favorite around my house. I happened upon a different shakshuka recipe today, but diverted right back to here, once I remembered how long it’s been since we’ve had them! This is brilliant ! Thank you for solving my guest breakfast dilemma . So many great ideas. This is the first time I’ve been on your website, but there are loads of recipes I want to try and make now! Thanks for how much effort you obviously put into these recipes. Love the Man Cold! Trouble is, you need a wife to take care of you, but instead, you got a husband 😉. You’ve been doing it all I expect instead of lying around whining with a bell! Feel better!